The building is designed as a lattice structure composed of 24 cubes. Each cube represents a separate voluminal unit serving a specific purpose.The individual rooms are defíned by the position and number offields contained in such imaginary spatial chessboard. Square fields are delineated by fixed oř sliding walis respecting the basic structure. The fields are not differentiated and their nature is determined solely by content. Some cubes are interconnected in both horizontál and vertical planeš reinforcing a better perception ofthe geometrie structure. The building is conceived as an assembled steel skeleton with concrete and glass fillings. 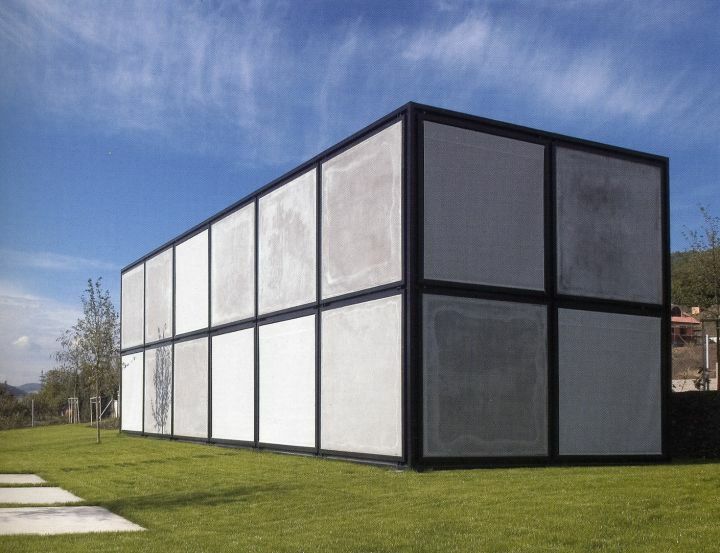 It is actually a set of building blocks employing 3m cube modules.There is no main facade.There is no hierarchy - all the different parts are interconnected using oné and the samé systém. Corridors have been eliminated in the entire house. The rooms are interconnected in different ways lending a spatial variety and flexibility use to the building. Both the architect and the client can move with great freedom within the defíned spatial grid.The architect may design oniy the basic spatial grid - a macro-grid - into which spatial elements will be introduced, in cooperation with the client, in order to create the individual spaces.The house in Beroun is intended as a cutout from the macro-grid.